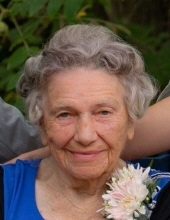 Margaret M. Preen, 97 of Perry passed away on Wednesday February 6, 2019 at Eastside Nursing Home in Warsaw. Margaret was born in Java, NY on August 7, 1921 a daughter to the late Augustus and Anna (Crahan) Schwab. She was a homemaker who enjoyed baking, cooking and taking care of her family. She was a member of St. Isidore’s Catholic Parish (St. Joseph’s Church in Perry). She is survived by 2 daughters: Patricia McIlwaine of Perry and Mary (Paul Oyer) Preen of Castile, 3 sisters: Eleanor Bush of W. Seneca, Rose Boxler and Joan (John) Knab both of Varysburg, 3 brothers: Robert Schwab of Warsaw, Raymond (Nadine) Schwab of Buffalo, Francis (Betty) Schwab of Perry, 7 grandchildren: Christine (Steven) Barnhardt, Lorie Burt, Rebecca McIlwaine, Joseph McIlwaine, Alton Bean, Susan (Curt) Scott, Melinda (Steve) Sacco, 12 great grandchildren: Amanda (Nick) Parsons, Ashley (Mark) Lorenzetti, Melissa Preen, Audrey (Timothy) Diliberto, Heather (Jordan) Buckley, Kaeleigh (Jake) Puglieses, Emily Bean, Justin (Amber) Sacco, Stephanie (Randy) Sacco, Lindsey (Derrick) Scott, Jade (Ron) Konka, Keagan Scott, 15 great great grandchildren: Mason, Brianna and Cole Parsons, Ava, and Natalie Lorenzetti, Marley and Aliana Little, Paisley and Kennedy Diliberto, Oliver and Marley Puglieses, Vance and Emma Sacco, Aria and New Baby Miller, Bennett Konka, along with many nieces, nephews. Along with her parents she is preceded in death by her husband Wesley Preen, grandson: David Preen, great grandson: Michael Wesley Preenand 6 siblings. Family and friends may call from 5-7pm on Saturday February 9th at the Eaton-Watson Funeral Home, LLC. 98 North Main St. in Perry where services will follow at 7pm. She will be laid to rest in Glenwood Cemetery in Perry. Memorial contributions can be made to the family. To send flowers or a remembrance gift to the family of Margaret M. Preen, please visit our Tribute Store. "Email Address" would like to share the life celebration of Margaret M. Preen. Click on the "link" to go to share a favorite memory or leave a condolence message for the family.